Home→Quick2Wire→Quick2Wire – Boards are here! Quick2Wire – Boards are here! The Quick2Wire project has been in the process of designing some new interface boards for the Raspberry Pi for some time and now they have some hardware! The main board connects to the Raspberry Pi with a standard 26-way ribbon cable. To the left and right of the main board are expansion sockets for SPI devices and at the bottom is an 8-way GPIO connector and the I2C connector. I2C boards can be connected in series, so the board I have here has a 2nd I2C connector for the next board along. On the main board, there is an 8-way connector for the Pi’s own GPIO connections. This is protected by resistors and zenier diodes in the same way as Mike Cooks Pi Breakout Board. This means that you can connect it directly to LEDs without any series protection resistors and that it’s also tolerant of 5v (or maybe more) going into the board accidentally. The main board has a 3.3v voltage regulator which is passed to the peripheral boards. This takes the load off the Pi’s own 3.3v supply. It also features an LED and a button – these are connected to pins 1 and 0 respectively, but via little jumpers, so if you need to use those pins for other uses, then you can. Finally, on the main board there is a buffered serial port connected to the Pi’s on-board UART. This will drive standard 5v TTL type devices and be safe when driven by them too. I used the gpio command in wiringPi to give it a test and didn’t have any issues. 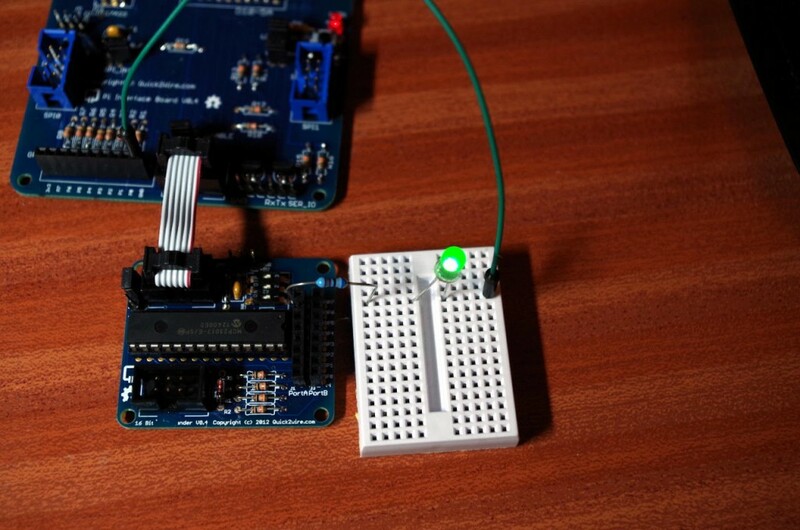 gpio pwm 1 500 # On-board LED to half brightness. and it lit up, as expected. Device 0x20 is the I2C code for the MCP23017 GPIO expander chip, so it was detected correctly. The expansion board has a set of switches which allow for it to be set to 8 different addresses, (0x20 through 0x27) so it’s possible to have up to 8 of these boards connected if required! I’ve temporarily put the program here: http://unicorn.drogon.net/q2w.c but will likely be moving it and writing something to integrate the Q2W boards better into wiringPi. So, a nice little main board with easy to add expansion boards using SPI, I2C and the Pi’s on-board GPIO. Could you explain this a bit further please? I wrote it purely for convenience as I have Pi’s that do different things, depending on what I’m doing – if I have a Pi that was dedicated to an application an always needed I2C, then I’d simply add it into /etc/modules and reboot and then it would always be loaded at boot time. and it would load the right modules for me. It has an additional feature in that it changes the ownership of the /dev/ entries for I2C and SPI to that of the calling user, so you can then use I2C and SPI without needing to be root, if required. and some documentation for gpio is here: https://projects.drogon.net/raspberry-pi/wiringpi/the-gpio-utility/ although I’ve just noticed it’s somewhat out of date! The man page (man gpio) that comes with it is up to date though. 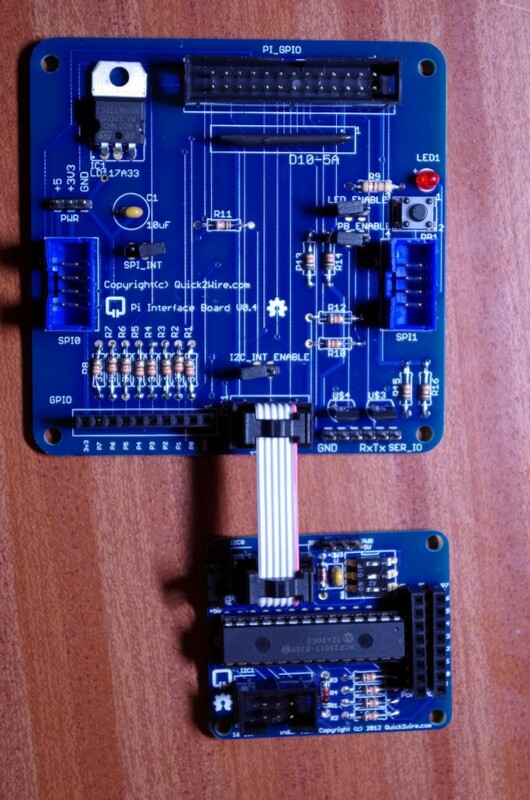 I’d really appreciate a comparison of the new GIO expansion boards. P.S. : just because i added some link references I’m flagged as spam? damn…. I’ll see what I can do sometime. The only one I don’t have is the RaspiCom one. Looks intersting though.